Our Sports Camp program is a dynamic program for children to enjoy all year long. Whether they attend in the summer, winter or both, your children have the opportunity to experience fulfilling extracurricular activities. Our program allows children to play with others their own age and participate in many activities they may otherwise not be able to experience. With gymnastics and the use of our indoor climbing wall, as well as exploring different Anchorage businesses and sights on Field Trips, your child is sure to have fun. During the Summer students take gymnastics classes in the morning. Gymnastics builds upper body strength and coordination. Participants receive training on the tumbling floor, bars, beams, vault and trampoline. Painting, drawing, collage, kites, make play dough, crafts, mobiles, puppets and more. Each child is encouraged to be creative. Our outdoor activities involve relays, ball games, circle games, playing at the park and more. Field Trips and walks to the park are a fun way for the children to explore and learn about the world around them. Field trips include the Anchorage Museum, Alaska Museum of Science and Nature, bowling, mini golf, Alaska Zoo, swimming and many others. During the school year, our After School Sports Camp is held Monday through Friday from the time your child arrives after school until 6 p.m. We pick children up from over twenty schools in the Anchorage District. Children up to 13 years old are accepted. The activities they may participate in can include rock climbing, arts and crafts, ping pong and various indoor sports, playing in the gym/gymnastics, puzzles, games, science exploratory and occasionally watching a G rated movie. If your child attends a school that is not listed here and you would like to have your child picked up after school, please contact us to see if we may be able to accommodate you. The following are Anchorage School District Holidays or In-Service days that we offer a full day or half day Sports Camp program. In-service, Holiday and Vacation Sports Camp is offered during Anchorage School District's In-service or Vacation days, including Christmas Break, Spring Break and Summer. The daily schedule is generally the same as our daily summer schedule. The program operates Monday through Friday and is for children in Kindergarten to 13 years (all children must be picked up by 6:00 p.m.). Space is limited and fills up fast so you are encouraged to call early to get placement. Students may sign up for half days or full days. We have continuous enrollment until our space is full. All fees will be prorated accordingly, and all fees must be paid in advance (no cash refunds). We require written notice before you stop enrollment, otherwise we will assume your child will continue into the next month or session and you will be billed for it. Children must be completely potty trained prior to admittance. 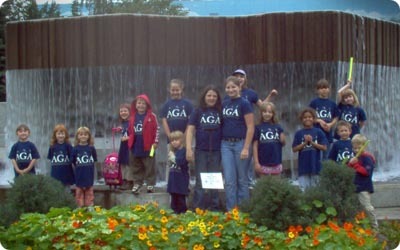 If there are any changes in your child's health status, please notify the AGA staff. Required immunizations include diphtheria, tetanus, polio, measles and pertussis. Before your child can be enrolled we require copies of the following paperwork: current shot record, physical examination within the past year, Emergency Card (from AGA), any custody papers required by the court. If you would like to enroll your child in our program please fill out the forms, stop by or call us. We would be happy to mail them to you upon your request. Acceptable forms of payment include cash, check and credit cards.